Barstools and counter stools offer a comfortable seating option for kitchen counter areas, pub tables, and dining rooms. Ranging from traditional to modern, you can find barstools in a wide range of styles and looks. A contemporary kitchen area is given a new look with stylish stools. 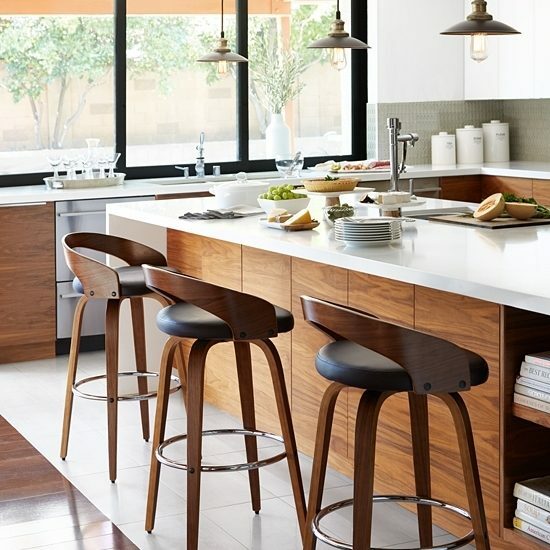 Barstools and counter stools are often talked about as if they were the same thing, but they actually refer to two different sizes of stools. Bar height stools generally have seat heights that are around 28 inches high (28 to 32 inches as a rule) in order to fit under table tops with a height of 40 to 42 inches. Counter stools have a seat height of 24 to 27 inches high for table surfaces that are 36 inches high. Pair counter height stools with 35 to 39-inch high tables. We recommend measuring the distance from the floor to the underside of your counter before ordering so you can narrow your product search to either bar height or counter height models. Of course, the above-mentioned bar and counter heights may exist only in a perfect world. Your own table or counter height may be higher or lower than the norm. 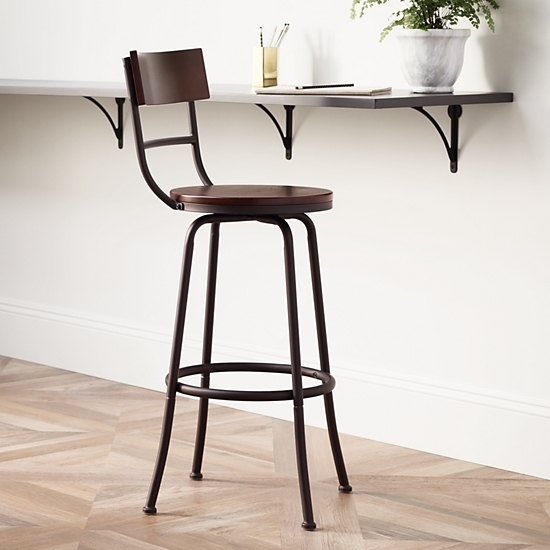 For extra tall table or counter surfaces, you’ll either need an adjustable barstool design that can accommodate your need or an extra-tall barstool. Adjustable stools make size customization easy. As their name implies, these stool designs are specifically constructed to be altered to match a variety of different heights. This type of barstool has a seat mounted on a hydraulic column. At the touch of a lever, you can change the seat height, a plus for smaller children or when you need to accommodate guests of varying heights. Tip: In general, when determining the appropriate seat height, make sure there’s at least 9 to 12 inches of space between the seat top and the bottom of the bar/counter. How Many Barstools Will I Need? The answer to how many stools you’ll need depends on how big a counter space you have and how many guests you are trying to make room for. Barstools should match the overall decor of the dining area for a sense of unity. For stools 16″ to 18″ wide: Allow for 6″ between each seat. For stools 18″ and wider: Allow for 8″ to 10″ between each seat. Swivel stools: Allow extra room between each seat, to make it easier for people to get in and out of the stool. Aside from adjustable barstools and counter stools, there are other options and features you might want to consider before you buy. 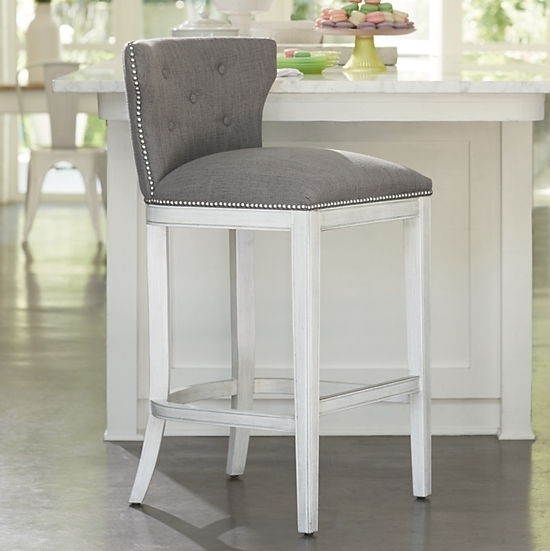 Armless barstools allow for easier access and don’t take up as much space as a barstool with arms. 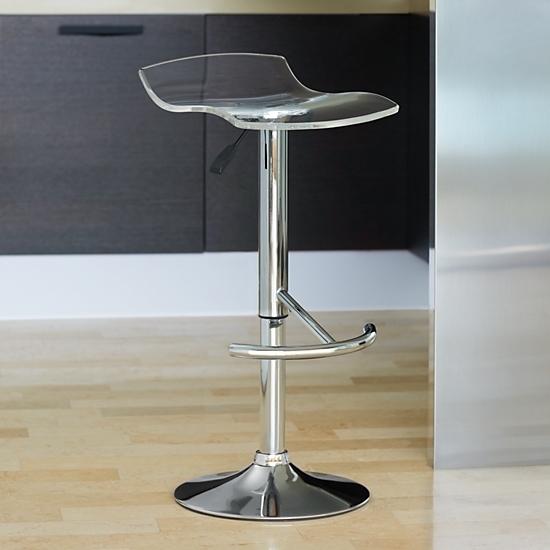 Swivel barstools have a seat that rotates, allowing guests to easily sit and exit the counter areas. This design is a perfect addition to small or minimalist spaces. 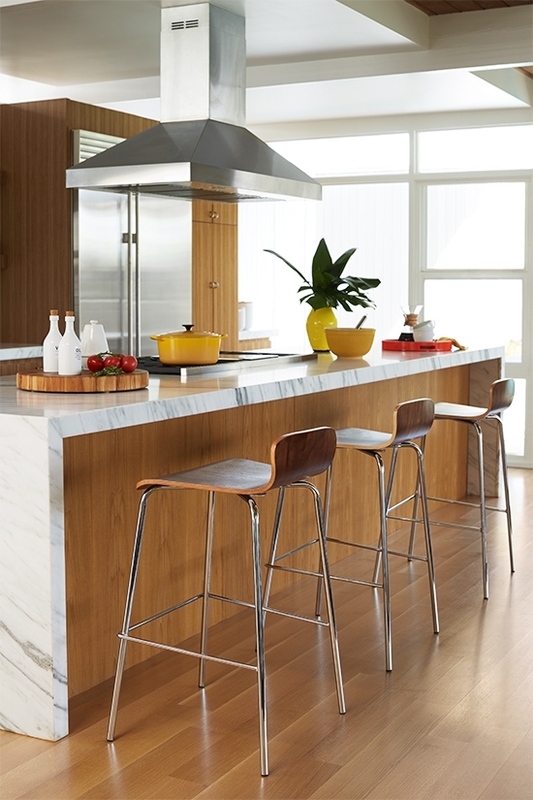 Like armless barstool designs, backless barstools create a more streamlined look. Backless barstools can also slide right under the counter, which makes them take up less visual space, a plus for smaller spaces. For a more traditional bar setting, or for greater comfort, a stool with a back and arms may be more appropriate. 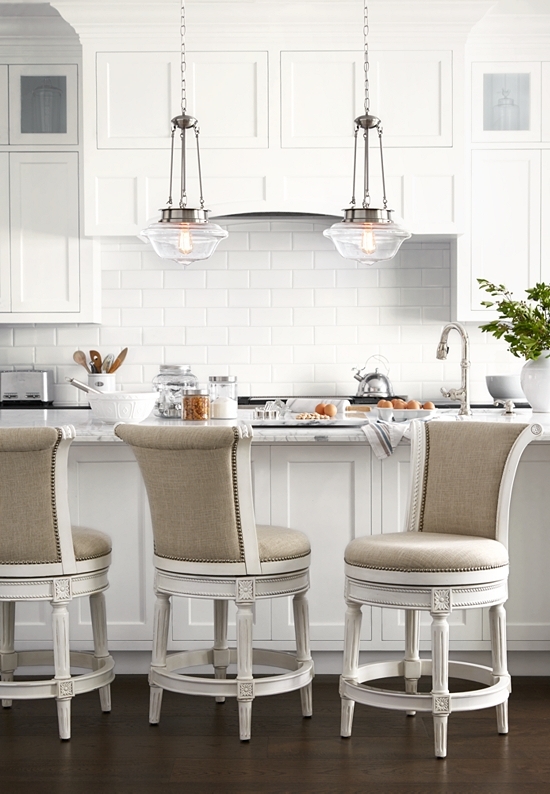 Choose an upholstered barstool or counter stool for a more refined, sophisticated look. You might also want to look at different materials, such as metal, wood or leather to find barstools that best match your home decor. 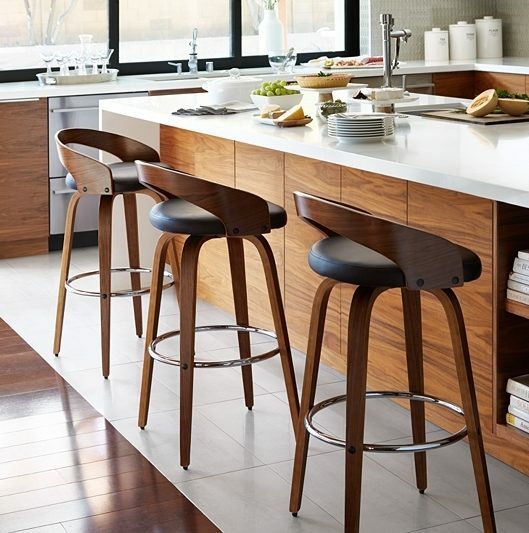 With a plethora of options at your disposal when shopping for a barstool or counter stool, you are sure to find the perfect one that will work with your kitchen or bar set-up and match your home’s interior design at the same time. Upholstered: Extra style and comfort. Leather: Attractive look that easy to keep clean. Wood: Both durable and handsome. Metal Finishes: Iron lends a classic look; chrome adds contemporary appeal. Many barstools are shipped completely assembled. Simple assembly is sometimes required—such as assembling the legs and fastening leg rests—and will be noted in product details online. Unless otherwise noted, the maximum weight limit for our barstools is 250 lbs. Call 800-782-1967 to speak with one of our friendly, professional Lighting & Home Decor Consultants or visit a Lamps Plus location near you. Whether via phone or in person, we’re happy to assist you in completing your project.